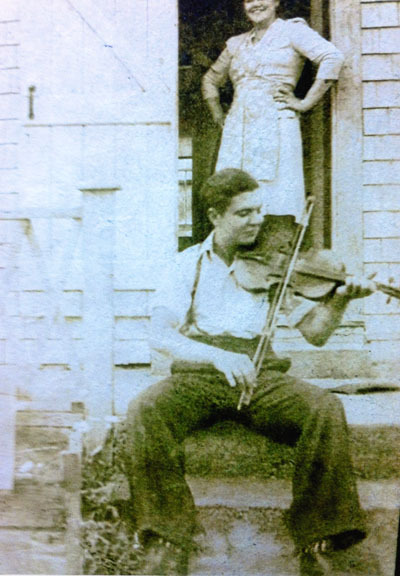 This memorial honoring Cape Breton fiddler Joe Cormier was written by friend and fellow musician John Mark Garrison. Two of Joe’s biggest musical influences were Angus Chisholm and Winston Fitzgerald, two of the greatest Cape Breton fiddlers who used to visit his house when he was growing up. From them and others, Joe learned the old Scottish repertoire and style that is the heart of Cape Breton fiddle music. By the time he was a teenager, he was already playing regularly for dances throughout Cape Breton. In 1962, Joe moved with his wife Norma, and their children to Waltham, Massachusetts. He worked as an electrician and was a force in the local music scene. He played regularly at the Saturday night dances held at the French American Victory Club in Waltham and at the Canadian American Club in Watertown. 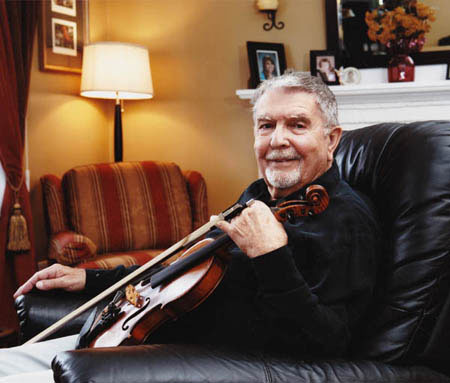 During the 1970s, Joe performed from time to time with the “Cape Breton Symphony,” a group of four or five traditional fiddlers that appeared on the weekly “John Allen Cameron Show” on Canadian television. In 1974, Mark Wilson recorded an influential LP album of Joe’s music for Rounder Records. Although several LPs of Cape Breton fiddling had been available in Canada, these were mostly reissues of earlier 78s. Joe’s record exposed the music to a wider audience and played a significant part in reviving this beautiful and ancient tradition. Joe continued to play regularly and record, doing three more solo CDs for Rounder as well as several recordings with other fiddlers such as Jerry Robichaud and his nephew J. P. Cormier. In 1984, Joe was awarded a prestigious National Heritage Award Fellowship from the National Endowment for the Arts. He was also one of only six traditional fiddlers chosen to participate in the “Masters of the Folk Violin” tour produced by the National Council for Traditional Arts. In 2006, Joe was awarded an Artist Fellowship in the Traditional Arts by the Massachusetts Cultural Council. I was lucky to know Joe for the past 20 years. In spite of his immense talent, he was very modest about his music and encouraging to other players. Every Wednesday evening, he invited a small group of younger players to his house to share tunes and stories. Joe loved the old style of playing he learned from Angus, Winston, and the other great fiddlers he grew up listening to. At the same time, he had his own unique ‘touch’ which imparted a wonderful lilt and swing to his playing. He is survived by his wife Norma, his six children as well as numerous grandchildren, nieces and nephews. He touched many people with his music and his warm and generous spirit. Previous Previous post: Interested in applying for a Traditional Arts Apprenticeship? Next Next post: Archiving Folklore Collections: Who’s in Charge?